Guest blog from Matt Northam. I am sure most of you have read about Converged Systems and maybe even Hyper Convergence but with this being November I am wondering how many of you have heard of Hairy Convergence, the speed of Tache! This is the phenomenon sweeping our shores, and it happens every year around this time, where facial hairs converge around the upper lip on men’s faces. It has come to my attention that on the 21st November, in the small village of Solihull, many men afflicted with this Hairy Convergence will be congregating (thought of using converging here but too much??). This gave me an idea. I have had a cancer that Movember raises money to fight (and a damn fine job they do). I have sponsored the one very facially hairy Christian Mohn for Movember as well he asked first and having only seen photos of him with a full a viking worthy beard it was worth it to see him cleanly shaven on 1st November!! I want to do more and since I am fighting the convergence of hair this year I would like to sponsor more of my fellow VMUG’ers…..BUT who? So here is the plan, I don’t have a book to give away, I struggle with ones that don’t have pictures, hell I don’t even blog. The 140 character limit of twitter is my limit…..I don’t have any fancy corporate goodies either to give away but what I do have is a bright pair of yellow trousers (yes I do Lee Dilworth!!) AND a desire to help fight these cancers Movember are winning against. Anyone attending the UKVMUG on the 21st who comes past the Nutanix stand (yes I am an employee of Nutanix BUT this is a personal thing!) 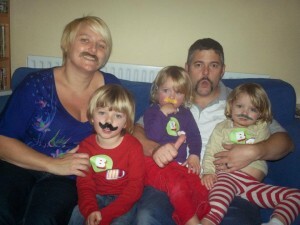 and gets a photo with me with their ‘MO’ and my yellow trousers will be entered into a draw. The best Mo will be chosen by Linda Smith of Global Knowledge (thanks for volunteering Linda) and I will then donate £100 of her majesty’s finest pounds to their Movember charity page. I am sure we can also leak the photos for comic value. This is not a gimmick just a fun way for me to help a charity who’s fantastic work helped me personally and enabled the NHS to beat my cancer. Also I get a great excuse to wear my bright trousers and have fun with my fellow VMUG community people. Also being at the Motorcycle museum the thought of Steve Bruck with a tache is too good a photo opportunity to miss, Village People anyone? Thanks and see you on the 21st……..
P.S. If anyone wants I have the Movember prize I won when I did it 2 years ago and it is a book all about growing and tailoring your Mo…..happy to loan out for some final grooming tips!